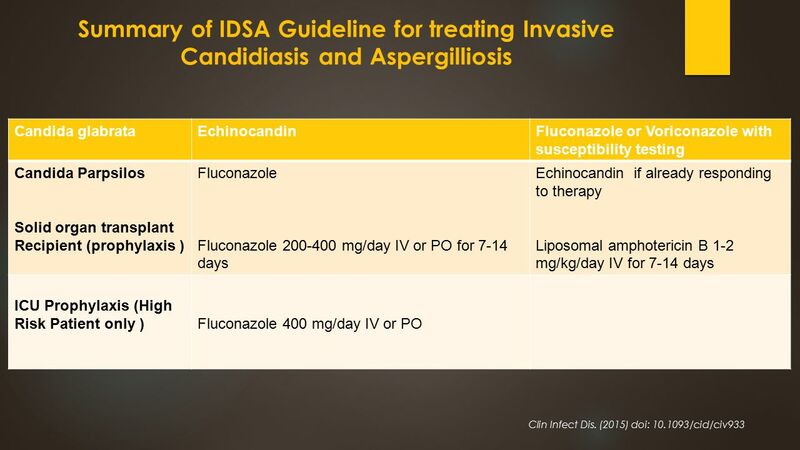 New guidelines for the diagnosis and treatment of infections due to Aspergillus species were published in August of 2016 by the Infectious Diseases Society of America (IDSA) (1), replacing those previously published in 2008 (2). These guidelines incorporate new data published between January 2008 and December 2014. The document provides guidance on non-culture-based diagnosis of �... Practice Guidelines for the Diagnosis and Management of Aspergillosis: 2016 Update by the Infectious Diseases Society of America. title = "Practice guidelines for the diagnosis and management of aspergillosis: 2016 update by the infectious diseases society of America", abstract = "It is important to realize that guidelines cannot always account for individual variation among patients. 15/02/2016�� 1. Clin Infect Dis. 2016 Feb 15;62(4):e1-50. doi: 10.1093/cid/civ933. Epub 2015 Dec 16. Clinical Practice Guideline for the Management of Candidiasis: 2016 Update by the Infectious Diseases Society of America.